I think I have a bit of mojo back. I've been able to create a card or two a day for the last week or so now. Hopefully, it will continue. This is a card I made for the Unity Friday chat after Christmas. We were supposed to take a quiz to determine our personality color and use it as the main color on a card. My color is black. I made this love card since I'm getting out of the Christmas spirit. 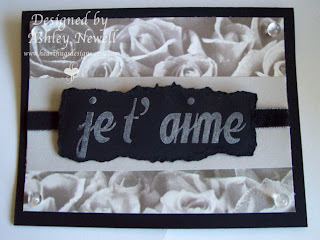 This uses the Unity Single Je t' Aime. I love French! I think it's very romantic so I wanted to make a little love card. Can't ever have too many of those around for the hubs! And here's another card I made. It was for a one layer card challenge. Now, I usually have HUGE issues with one layer cards because though I am a little bit more clean in my style, I love my designer paper. But this Unity Shine single really did all the work for me. I just added a tiny bit of color with some markers and some texture and shine with some Stickles. Then I added dew drops. Speaking of dew drops, here's my WARNING! Do not leave cards with dew drops unattended with your children. A certain *SOMEONE* managed to pry the middle dew drop off this card and EAT it while I was adjusting the picture. So, that's a lesson learned. I love both of these cards!!! you did a great job, and I had not thought of that before, but OMG I know Tucker would do the same thing!!!! Better be careful with those Dew Drops!!! 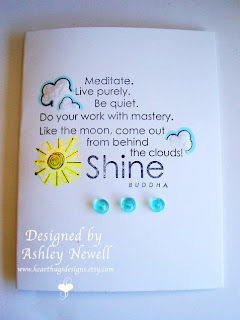 Love these cards Ashley!!! Love your single layer card - I've often thought that the dew drops looked yummy, so I could see where they'd look like candy to a kid! Love the cards! and I can easily see a youngster being attracted to the dew drops. I'm sure if my Belle was smaller she'd stick them up her nose, one of her fav things to do. Sigh. LOL! Hi Ashley! Love the cards! Finally getting a chance to stop by your blog. We're both on Danni's flutter by team. Looking forward to getting to know you! Very pretty cards! I love the one layer one, it's beautiful just like it is!! !